Yes, India’s Biggest Sale is back!!! This year Flipkart won’t disappoint it’s customers like last year. While product launches in categories such as electronics, appliances and mobiles are expected, throwaway sales such as mobile phones for Re 1 that were offered last year may not be available this time around. “Rather than the marketing deals (such Re 1 sales), we will offer significant number of products at a lower price to a larger base of customers,” said Ankit Nagori, chief business officer at Flipkart. Don’t have Flipkart App? Click below button to Install Flipkart on your Mobile. 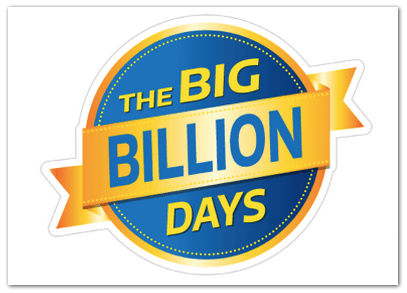 How different is Big Billion Days Sale 2015? This time, the sale will be of a longer duration and restricted to the app. No Re.1 products this time, instead products will be offered at very low price. This will be beneficial to larger customers. To avoid server crashes, Flipkart has installed its own data centres across major metros and will manage online traffic inhouse, unlike last year, when it relied on outsourced vendors. Ramped up logistics will have over 19,000 delivery boys, including those from Ekart, delivering to over 20,000 pin codes across India. This year the company is asking sellers to stock a large number of goods in its fulfillment centres. About 40,000 retailer are expected to sell through Flipkart during the sale. Myntra also joins the club. Start your online purchase with Diwali dresses at amazing price offer. No need to go to Textile shop or Malls and waste your money. Make a purchase of your branded dresses at lower price. Have a wishlist ready before the sale begins. Get Home and kitchen appliances at mind-blowing prices and please your parents. Like last year get Smartphone and mobile accessories at very low price. Enjoy buying new mobile gadgets and stay with fast moving technologies. Get the biggest discounts on automotive products and electronics. Get hot deals on books under various categories. Get additional 10% off with Credit/Debit cards of SBI, Citibank, Standard Chartered & Yes Bank. Cool isn’t it? SBI Offer- 13th & 14th October: With SBI card you are entitled to get an EXTRA 10% discount on your minimum purchase of Rs 2500 at this Big Flipkart Sale. You can get maximum cash back of Rs 750 on your buys. This super offer from SBI is valid for all Fashion & Lifestyle product purchases on 13th October . Citibank Offer- 15th October: This is the date when all Citibank credit card users can avail additional 10% instant cash back on their purchases at the Flipkart Diwali Sale. The maximum permissible discount is Rs 1,750 on a minimum transaction amount of Rs. 8,000. Go ahead; shop till you drop with your Citibank credit card! Standard Chartered Offer – 15th October: Get upto 10% discount with all Standard Chartered debit and credit cards. Yes Bank Offer – 15th October: Additional discount on Yes Bank debit cards . Want to stay ahead of the rest? Want to get those mind-blowing offers before anyone else does? Well, then here’s what you need to do to gear up for the Big Billion Days. Step 1 – Download the Flipkart App. If you already have it, make sure it’s the latest version that has the Ping and Image Search Feature. Now, the reason why we are asking you to download the app is simple – The Flipkart Big Billion Sale is App-only. Yes, sounds awesome, right? You don’t have to log in to a system or anything, simply use the app to shop from wherever, whenever. Step 2 – Get your Wishlist ready before the sale. Yes, this sale is going to be huge and if you don’t plan ahead, you might miss out on some of the craziest Big Billion Days offers. So sit down, browse through our extensive collection of products that ranges across mobile phones, home & kitchen appliances, books, furniture, large & small appliances, laptops and sports & fitness. If you like something, tap that little heart icon that you see next to the product to add it to your Wishlist as you go. Step 3 – Save the addresses beforehand. We know how annoying it can be to enter all your shipping details when you’re in a hurry to place an order before a product is out of stock. It’s almost akin to hunting for change to pay the cashier during a mall sale, so save the address people! Half the job’s done already. Step 4 – Since you’ll be buying a lot of gifts, Cash on Delivery is not such a convenient payment option. So save your Debit/Credit Card details and enjoy a faster check-out. All these details are safe with us, don’t worry. Step 5 – Keep calm and spread the word! Yes, wouldn’t it be awesome to have all your friends and family members shopping during this BBD Sale? This is the post everyone should read to enjoy shopping with flipkart big billion. Thanks for such Informative post. I like the way how you make all the steps very clear.